The Brits seem to be obsessed about the war, given the sheer volume of film and literature devoted to its depiction. It sort of makes sense that they would be, given the significance of the moment and the “rising against the odds” nature of their (spoiler alert) eventual victory. Churchill himself has been portrayed on film (35 times and counting) and television (28 at last count, John Lithgow’s work in The Crown) so many times the playbook has it down pat. So you need to do something truly special for it to rise above the ordinary … which is what Joe Wright and Gary Oldman have done here. The film rises above the tropes one comes to expect from British historical films – which are usually gussied up made-for-TV movies punching above their weight – thanks in part to the unique vision and flair of director Joe Wright. The film serves as a fitting companion piece to his excellent 2007 war-romance Atonement, which featured a stunning, elongated tracking shot depicting the hellscape of Dunkirk; it also works in tandem with Christopher Nolan’s Dunkirk – a film it seems is happening in tandem to this one. Churchill, ensconced in Whitehall trying to figure out how to evacuate the beach and being all but stumped by the notion. Wright applies a unique visual style, fills it with his own quirks all the while not really drawing attention to himself. You can’t fault Gary Oldman’s performance in Darkest Hour. 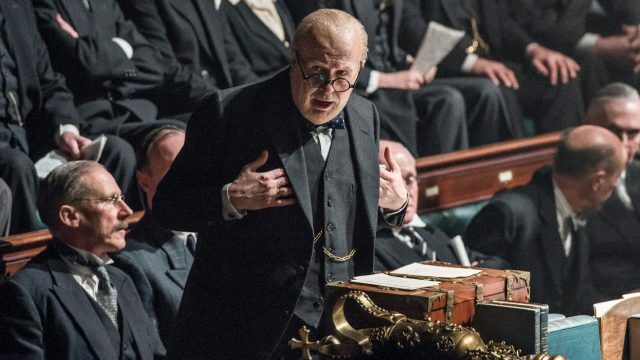 In his portrayal of Winston Churchill, he manages to shy away from the standard tricks of bombast and acting through the jowls with bluster and spittle. But Oldman, who can go from subtle (Tinker, Tailor, Soldier, Spy) to exaggerated (Sid & Nancy; Leon) to bizarre (The Fifth Element), finds a dignity, sympathy, and humanity in this role of epic, historic value. Oldman’s Churchill is essentially flying by the seat of his pants, taking risks, surrounded by naysayers, and essentially all alone in the world. It’s an unexpectedly grounded and stunning performance. Given the volumes of work surrounding this point and place in time and these characters, it stands to reason that perhaps Darkest Hour might be the last we see of Churchill, Chamberlain, George VI et al on screen. It’s been done, and well. And given the weight and artistic merit of this one, we might conclude that nobody need try to outdo it.